A man has been remanded in custody until his trial date next month. Remo Nardini, 57, denies a charge of threatening or abusive behaviour towards his former partner and estranged son at his home in Longcroft Crescent on March 24. He also pleaded not guilty to failing to stop in a vehicle when requested to do so by a police officer. 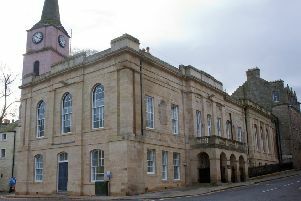 On April 6 he is said to have damaged property in Jedburgh Police Station by pushing a blanket down a cell toilet and jumping on it. Also on the same date he is accused of breaching his home curfew and also behaving in a threatening or abusive manner in various streets by shouting and swearing, making offensive gestures, persistently sounding a car horn, playing loud music and causing the car engine to make excessive noise. Nardini denies all the charges against him and will stand trial at Jedburgh Sheriff Court on May 5.